Cogni-Flex isn’t advertising just any ol’ nootropic supplement. These guys are claiming to deliver the nootropic Holy Grail. You know what I’m talking about: The Limitless Pill — and, guys, if this is it, if this is the pill that inspired NZT-48, the pill that transcended Bradley Cooper to beyond Icarian heights, then I think we need to re-evaluate the movie: Because all he’s been taking are caffeine pills. This is worse than any M. Night Shyamalan twist we’ve ever seen. On the same level as the Space Jam “It’s just water” twist, minus the heartfelt inspiring message. Most of the ingredients are hidden away in Cogni-Flex’s proprietary blend, in which sits the classic L-theanine + caffeine nootropic duo. Bacopa and Rhodiola encompass the stress-free adaptogen portion of the formula, yet could use a little more lovin’ in the quality and quantity departments. Other Ingredients: Gelatin (Capsule), Cellulose, Silica, Magnesium Stearate, Titanium Dioxide, and FD&C Blue #1. Directions: As a dietary supplement, take two (2) capsules per day. Vitamin B6 (as Pyridoxine HCl) – Purdy good dosage of this mood boosting circulatory enhancer, but the P-5-P form is better than Pyridoxine HCl. More on Vitamin B6. Acetyl L-Carnitine – ALCAR seems to come standard with manufactured nootropic stacks, despite not really doing anything until old age. More on ALCAR. L-Theanine – Fun Fact: I’m on L-Theanine right meow. One of the best natural nootropics for its reliable anxiolytic relaxation effects, particularly when stacked with the next ingredient. More on L-Theanine. Caffeine Anhydrous – CAAAFFEEEEEEIIIIINE!!! Not a true neuroprotective nootropic but still… it’s caffeine, y’all. More on Caffeine. Bacopa Monnieri (Leaf) – The correct answer: Bacopa Monnieri extract — oo sorry guys, close though! Still a great Ayurvedic adaptogen memory and learning enhancer. More on Bacopa. Rhodiola Rosea (Root) – Again, I was looking for Rhodiola Rosea extract, not just plain powder. One of my favorite adaptogens for its potent anti-fatigue effects. More on Rhodiola. Screenshot of the Cogni-Flex website. I have to give props to Cogni-Flex for their ad copy: It’s surprisingly detailed and well-organized. Unfortunately, the formula itself is not, and I’m taking some of those props away for the product’s prop blend — the proprietary blend, which obscures the individual dosages of 5 of Cogni-Flex’s 6 ingredients. Many supplements do this trick (yes, I qualify it as a trick), yet it’s especially egregious when a caffeinated cognitive enhancing supplement does it — also, just because everyone’s doing it doesn’t mean you have to, Cogni-Flex. After all, the blend prioritizes caffeine over the adaptogenic herbs (Bacopa and Rhodiola), which require a much higher dosage than caffeine. And frankly I don’t have much confidence in most of the ingredients working, considering that meh 688 mg dosage. The best nootropic synergy comes from the L-theanine + caffeine stack. As I suggested earlier, I’m on L-theanine right now, which I consumed concurrently with coffee, i.e., caffeine. The stack is great for quick, reliable boosts on focus and energy. The caffeine + L-theanine duo is a classic nootropic stack, and Cogni-Flex does it right by prioritizing L-theanine over its caffeine. Ignoring their below average quality, the proprietary blend’s ingredients display a well-researched assortment of anxiolytic focus enhancements. At least we know the Vitamin B6 dosage! The proprietary blend is a major bummer and especially suspect given the formula’s reliance on caffeine, a crutch compound to nootropic supplements. Bacopa and Rhodiola need to be upgraded from plain powders to potent standardized extracts to work in this formula. Cogni-Flex isn’t the cheapest product, despite having cheap ingredient quality, and buying from Amazon actually turns out to be more expensive this time around. 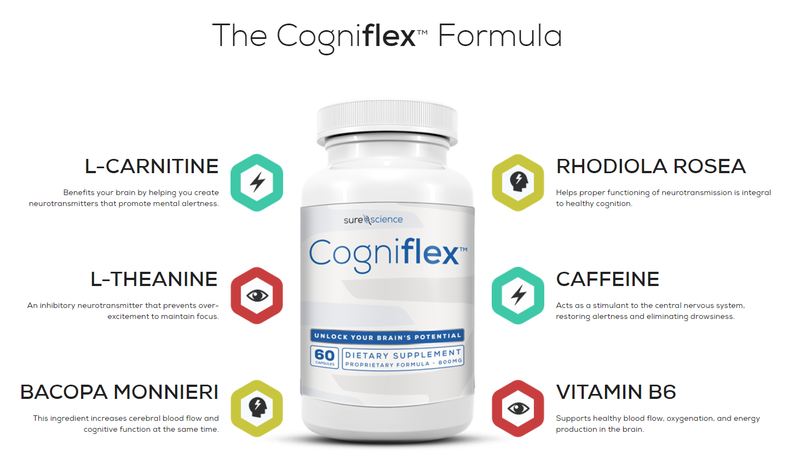 Cogni-Flex’s ad copy purports the following benefits: Increase Energy, Improve Focus, and Boost Brain Power — although it doesn’t exactly detail who these benefits are geared to. Based on the young, hip guys covering their page, I’m assuming the product is aimed at the twenty-something thinker. 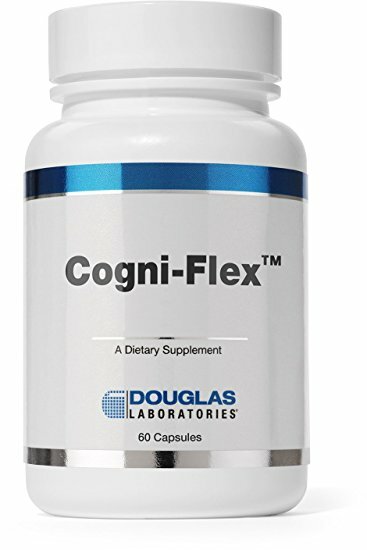 You can buy Cogni-Flex directly through the manufacturers as well as Amazon. If it’s sold elsewhere, I haven’t found the spot. The customer reviews are against this one, accusing the product of either: A) selling glorified, overpriced caffeine, or B) simply having no effect on cognition. And it’s no wonder: Cogni-Flex has an awful design. Had the manufacturers placed more money and effort into the manufacturing process instead of the advertising, then… well, to be honest, they probably wouldn’t have made as much money because that’s just the Way of the World. Even so, the inner romantic in this nootropic geek still holds the hope that well-crafted formulas can outperform shoddy products strictly on merit alone. Don’t believe me? Then check out my top rated supplements of 2017.